Three days into the ‘Beast from the East’ and, despite temperatures feeling like -11oC, the water in the basin and on the river is not frozen. 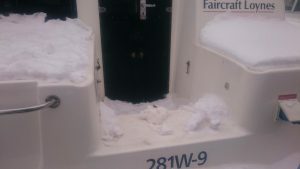 We still have a covering of snow which is becoming frozen and compacted as it is too cold to thaw. 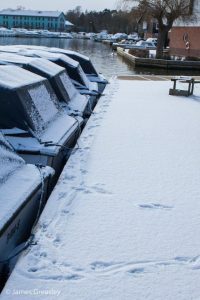 Perhaps the best thing about the snow on the ground, particularly when it lay fresh and untouched, were the animal tracks. 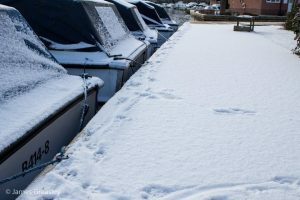 Over the last few weeks we have regularly seen our boatyard otter, but the snow now reveals much more about what the otters get up to, a real insight into their behaviour. Our favourite find though, is the spraint carefully positioned on top of a cleared and mounded bit of snow at the back of a hire cruiser. We have seen similar behaviour where an otter will use a high point of mooring ring and rope on which they lay their spraint. In the countryside otters will tuft and twist up a bit of grass to create a more ‘natural’ mound.